I like the sitcom feel about this show, it’s zippy and fun, and things don’t get withheld for too long. When the truth comes out in the open, things are handled surprisingly lighter than one of them expected. Because even though it’s a big deal for you, it’s mediocre to someone else. When it comes to opening up and connecting with someone else, it all depends on where you are in life and whether timing is on your side. Truer words. Timing is EVERYTHING, in this lifetime or previous. Risa and Preaw, along with their backpacker arrive at the hotel late that night, however, Risa’s reservation was booked for October. Ha. The hotel is at capacity unless the last guest doesn’t show up for his/her check in. But it turns out the hitchhiker is that last guest, and like a gentleman, he gives up his room for them. Priew sets up a tent for him in the courtyard as a token of her appreciation, and Risa compliments her friend on a job well done but only serves to remind Preaw that her ex-fiance had been the one to teach her. Risa promises not to bring him up again but proceeds to say his name a few more times. Oops. Before leaving the gentleman to his tent, Risa sneaks a quick photo of him. She sends that pic to her friend who confirms that the backpacker (whose name is Peet) is handsome and he must be her soul mate. But if she wants to snag him, she best take advantage of the fact that Preaw is nursing a broken heart and flirt with him quickly. However Risa is a little inept in the flirting department and asks her friend how she ought to go about doing that. Lol. Friend advises that she go all in and find ways to talk to him, just like the column she wrote about. So Risa finds excuses to see him again by offering a blanket, mosquito repellant and finally, even water. Yet every time he asks if she needs anything else, she’s tongue tied. Pete breaks the ice and invites her to do stargazing with him, and Risa does a mental fist pump. Meanwhile Preaw is alone in the hotel room and wondering where her friend went. The alone time gives her a moment’s pause and she notices missed calls from Pap. This brings a flashback of the time he had been worried about her when she didn’t pick up her phone. He had driven from Hua Hin just to check in on her. The memory sends her reeling with tears as she peruse through their happy pictures. Aw. Risa and Peet remark on the beauty of the starry night. Peet clasps on his pendant as he smiles up at the skies, which makes Risa question whether he’s making a wish or he simply likes to stargaze. Peet answers no to both and Risa wonders if that means he brought her out here to flirt with her. Lol. Pete lays on the grass and Risa has a million comments running through her head – should she lay on the grass too? should she make a move? WHAT should she do? She opts to lay down next to him and when he turns to her with a smile, she misinterprets it as HE’S GOING TO KISS ME. But instead he imagines that he’s looking at a different face. His girlfriend? Now that’s just sad. Risa opens her eyes to Peet playing on the harmonica and mentions how dreamy he is. She stalls the time with him by asking the names of the stars. Preaw proceeds to delete all of their pictures from her phone through tears. How torturous. She even declines a call from him. After awhile Risa feigns sleep in order to get him to carry her back – she’s hoping that they’ll go back to his tent, but he deposits her by her room. She doesn’t let him take her to her room in fear that Preaw would see them. Preaw lays awake in the wee hours of the early morning. Tears escaped her eyes no matter what as she thinks about the Facebook post she saw from Pap. He had apologized for his transgressions and begs for forgiveness. He asks for a second chance and promises never to hurt her again. And that he loves her forever. But the betrayal scene she saw that night could not be erased, and it surfaces in her mind again and again. She rushes to the terrace, crying out into the night. That is how Peet found her, and comments that she is an early riser. He invites her to watch the sunrise with him. At the top of the mountain we see Pete taking pictures of a pretty girl – the same one he imagines while star gazing. As he looks up from his camera though, the girl walks away and vanishes. Behind him another girl approaches him, it’s Preaw, who hugs herself as the sun rises. Peet laments that someone once told him that a sunrise symbolizes the start of a new day, it is the opportunity to start fresh everyday. But Preaw says that it’s difficult for her. Peet agrees that starting over is difficult, but we have to be brave enough to pursue it. Risa wakes to an alarm clock and a note from Preaw that she had taken the car out to watch the sunrise with Pete. In a panic Risa learns that the best way to get there is by bike since there’s no car available at the hotel. And a child’s bike at that. Ha. You snooze you lose? Preaw thanks him for bringing her along and wonders what brought him to a backpacking trip alone. Pete shows her the pendant with a picture of his girlfriend, and says that he did not come here alone. He had promised his late girlfriend that he would take her on a backpacking trip but back then, he was too busy with work. She had wanted to stargaze and watch the sunrise here. Then we see in a flashback how much that previous time with her could make him regret it. She had begged him to go on a trip, stating that life is not all about work, but Peet argued that one needs money to play though. His girlfriend nudged that they could backpack and it wouldn’t cost too much money. He finally concedes with a pinky swear, but not until he receives his degree. Preaw remarks that after listening to his story, hers really pale in comparison. Peet advises that the severity of one’s situation is in due time, because when everything happened to him, everything feels big (drastic). I get it, things diminish with time, like anything. Preaw lets the tears fall as his words sink in. Meanwhile Risa gives up riding on the child’s bike halfway. Which is where Preaw and Peet find her. Risa stomps behind Preaw as they return to the hotel and whines that Risa should have woken her up. Preaw relents that she tried but Risa had refused to go, lol. Risa questions why Preaw didn’t tell her that she was going with Peet, which got Preaw wondering why SHE should tell her. Of course Risa falls back on her typical answer, it’s nothing, but wants to know what they talked about while watching the sunrise. Preaw shares that they talked about his girlfriend who passed away. He embarked on this backpacking trip to fulfill his promise with his late girlfriend. Risa finds that uber responsible and Preaw questions whether Risa wants to die and then have her boyfriend travel without her then? Risa clarifies that she just thinks it’s hard to find a man who keeps his words these days, even take a look at Pap for example. There she goes again. Risa immediately apologizes for her slip of the tongue. Preaw asks if Risa is into Peet then, but Risa denies her interest (WHY?) which of course Preaw utters, good! Because I like him. It’s decided that Peet will tag along with them until they reach Rat Samuan Dao, while the girls do pitstops at different temples along the way. Preaw comments that she wants to help him fulfill his promise to his girlfriend and Peet offers to be the driver. The girls side eye each other for shotgun, and guess who wins? I love how Preaw challenges her friend that if she wasn’t into Peet, then why would she want to sit in the front seat? Ditto. At the third temple, Preaw proceeds with her standard chants, but adds that she wishes Preaw would change her mind about liking Peet. Lol. Risa presses her friend to say that she forgives her, but Preaw refuses until Risa tells her why. However once Peet invites them to take pictures outside, and Risa says she won’t let her go until Preaw chants those words, Preaw immediately tells her what she wants to hear, leaving Risa to stew after them again. Ha. Risa watches Preaw skillfully ask for Pete’s number. She had taken a picture of him taking a picture of the temple. Risa wonders at the speed of her friend’s progress when she’s even tried to jump him already. In the car, Risa watches her friend earn even more brownie points as she gives Peet more of the air conditioning and cleans his sunglasses. But all this time, Preaw exchange a look with Risa, that she’s one man upping her. Risa chimes in that they should pull over for coffee, where she drags her friend for a private word. 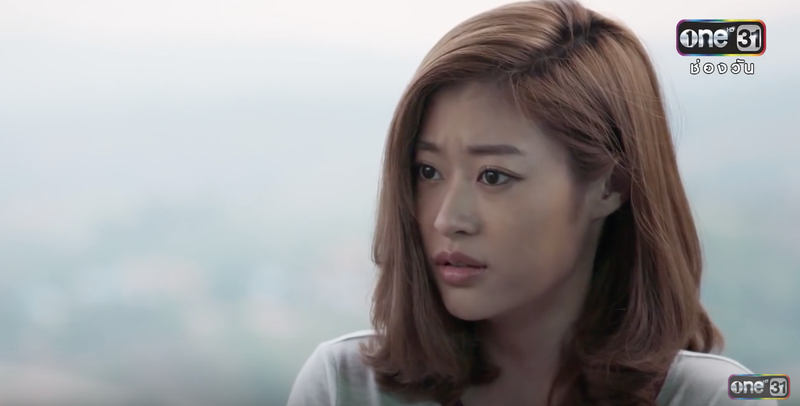 Risa questions whether Preaw is pranking her, knowing HOW she feels about Peet. But Preaw pretends she doesn’t know (well Risa never admitted to it) and asks Risa again – Risa says she’s not at the point of “liking” him yet. Preaw states that she LIKES him. Risa blurts that Preaw can’t like Peet because Risa wasn’t going to let her this time. “You’re telling me that I stole every one of them?” Preaw questions, taken aback. Preaw finally understands why she had to say that she forgives her. She learns that Risa is fully trusting the fortuneteller since she went to the extent of drugging her friend to go on this sojourn. Preaw asks her friend again if she likes Peet, but Risa laments that it’s her business and Preaw should stay out of it. Preaw begs to differ, at the end of the day, it comes down to who Peet likes. Preaw says she’s not challenging Risa, since she knows Risa always loses. Lisa argues that she didn’t lose, she gave them up. Uh huh. The two place a wager, if one of them can make Peet fall in love with them, then the other cannot get angry. Deal? Deal. Risa practically panics at the thought that Preaw is going to really challenge her this time. Because if she loses, then it’s not because she gave him up. Risa sidles up to Preaw and comments that her friend put on quite the heartbreak show last night. Preaw doesn’t dignify that with a response. Instead, she says that from this minute forward, whichever hand Peet uses to open the door, and one of them guesses correctly, that person gets shotgun. But Peet’s hands are full and he uses his back to push the door open instead. Buahahah. Then Preaw says whichever name he calls out first, that person will get shotgun. When he doesn’t say any of their names, Preaw one man ups Risa by asking Peet what HER name is. Thwarted again, Risa. It’s easy to see why Risa loses out in every relationship competition, whether she’s actually knowingly competing or not. Hopefully this competition will teach her to understand what her issues are and how she can do things differently. For one, she worries too much about other people and doesn’t put herself first. Secondly, she can’t admit to her own feelings or fight for them. Denial doesn’t get you anywhere, oh wait, it gets you repenting for your past lifetimes, and nobody wants to go there. Finally, she forces things without letting it happen naturally. Which is why Preaw wins. Even though she’s a private person, she too don’t let many people in on what she’s going through or what she’s thinking, but she’s genuine when she gets to know a man. We see that she learns about Peet’s sad past because she’s curious as to why he’s traveling alone – when all Risa could think about is that he must be attracted to her because he asked her to stargaze. Preaw allowed Peet to open up to her and share with her his past, that connection naturally made them closer. And Preaw goes after what she wants. These best friends are different in many ways, and I know it may seem like Preaw certainly got over her heartbreak rather quickly, but I think she’s just not showing it to her friend. I like that this episode showed us a deeper and mysterious side to Preaw. I want to know more about her and I can’t wait to see how this competition will change the two. What did catch me by surprise is Preaw’s reaction to finding out that Risa had liked all of the men she dated. I would feel a little put out by that info, but Preaw just takes it all in, which makes me wonder if she’s just putting on this competition to spite her friend. At the end of the day, I think Preaw just knows her friend better than her friend knows her. Isn’t that interesting? I love that the reward of this competition is that they can’t be mad at each other. I have a feeling that they will win more than just the guy. Perhaps by challenging her friend to come out of her shell, Risa will win either way whether she gets the guy or not. She needs to get a sense of self, and be true to herself so that she doesn’t have to rely on going to different temples in order to be allowed to meet her soulmate. And Preaw will find peace in her breakup and not have to pretend that she’s not falling apart inside. All in due time, my friends. The girls look great, whatever they’re using, I want some. Forever young is my goal. I had a train of thought while watching this, but ended up recapping it so late last night that I could barely string two words together. I’m just not a night owl, you know? I do value my sleep, but don’t ever get enough. ANYWAY, my thought was that the girls sure fell for a guy with a heartbreaking story real quick. It’s only been their first day and they’re already fighting over him. Nadech Kugimiya, he is not, because then the girls would have to get in line behind me. It is a weekend, mindless fun, so I’m not expecting to have much depth. I really think One HD need to up their game with their male leads. I feel like Channel 3 just KILLS it with the looks. And Channel 7 got Weir, and maybe that’s all they need. Whatcha got One HD? WAIT, there’s Sean, I’ll watch him any day.